A Small Size, Wide, Thin, Colorful, Visibly Aged And Anciently Used, Base Stemmed, Corner Notched Afton Point That Exhibits Surface Sheen And Overall Stone Coloration Aging Patination, Aged Surface Soil And Mineral Deposits, Polished And Aged Use Rolled Hinge Fractures, Aging In The Corner Notches, Correct Pentagonal Shaped Blade, Correct Material And Manufacture For The Area Found. Ex-R.W. Lyerly Collection. 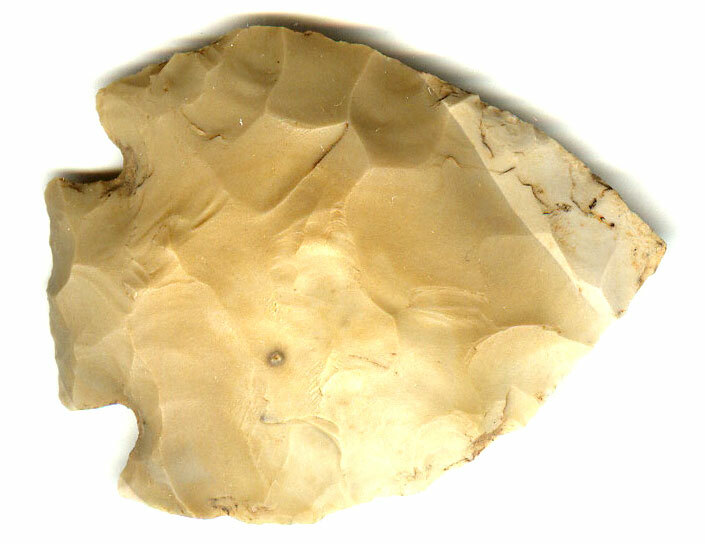 One Side Has A Portion Of The Cortex Visible Possibly Being Made From A Flake From A Cobble. Pentagonal Afton Points Can Be Base Notched, Corner Notched Or Stemmed. Includes A Ken Partain Certificate Of Authenticity.